With the largest screen size in its class, Lenus™ > Wrist is a fully-automatic digital blood pressure monitor that delivers fast, reliable measurements of systolic and diastolic blood pressure with pulse. Lenus™ > Wrist is so small and portable, that you can easily fit it inside a purse or toiletry bag. 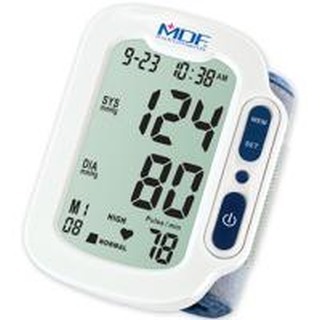 The convenience of this model allows you to quickly check your blood pressure in the comfort of your own home, office or while traveling. The WHO (World Health Organization) recommendation function will also assess your reading according to WHO standards and it also stores up to 90 prior measurements so you can track your blood pressure readings over time. And the impressive oversized screen with large, high-contrast letters means easier viewing usage for visually-impaired users. Just a few minutes a day can make the difference. Display: Lenus™ > Wrist boasts the largest digital display in its class of wrist-type digital blood pressure monitors.The impressive oversized screen size with large, high-contrast letters means easier viewing and usage for visually-impaired users. Battery meter indicates remaining battery life. Cuff: Resistant to abrasion, chemicals (chlorine and peroxide), and moisture, the adult Velcro® cuff is constructed of high-molecular polymer nylon, and is conveniently attached to the display for easy operation.